Rainbow Fish and the Sea Monsters’ Cave by Marcus Pfister – Cricket and I both enjoyed this Rainbow Fish book. I think it would be a great read for any child that is being fearful. We are working on being afraid of the dark so it worked right in for us. Rainbow Fish: Tattle Tale by Sonia Sander – I didn’t notice until we left the library that this was by a different author than the actually Rainbow Fish book. It didn’t flow in quite the same way, and it wasn’t actually about being a tattle tale. It was really more about gossiping. Rainbow Fish: The Good Luck Charm by Sonia Sander – Once again not actually by Marcus Pfister, but this one flowed better and was a more enjoyable read. It reminded me of the feather in Dumbo, that was used to build confidence and provide comfort. Rumpelstiltskin – This was a very simplified version of the story, if I remember correctly. Cricket didn’t really connect to this book in anyway, so it was a flop for us. Down Comes the Rain by Franklyn Branley – This was a great informative science reader, but it was just a little too advanced for Cricket. It did contain, what I think would be, a good simple science project to go along with it on condensation. A Rainbow of My Own by Don Freeman – Cricket really liked this book and the movement of the rainbow. When it was over she said she also wants a rainbow of her own. I’m going to be adding this to my book wish list. Cricket and I both loved this book. I loved the relationship between the mother and her bunny, and the way that the mother handled the runaway threats. We also really enjoyed the illustration pages that followed each scenario. It was a great opportunity to discuss the story, and work on comprehension skills. That makes 103 books total so far for 2011. I’m over half way to my goal, but I intend to keep going after that. A Dazzling Day (Disney’s Tangled) – Cricket got this book from a friend for her birthday, and we have already read it multiple times. She likes it because it’s about Rapunzel. I like that like many of the disney books it focuses on the bright, happy part of the story and skips some of the mean, scary parts. Go Dog, Go! by P. D. Eastman – We recently received this book from a friend, and I am so thankful. It was one of those books that just clicked with Cricket. She was engaged, interested, and grasping words and concepts. She also liked it enough to ask for repeat reads! Thank You God For Mommy! by Amy Parker – See review here. Tinker Bell’s True Talent (Tag Reader Book by LeapFrog) – I am making an effort to read Cricket’s Tag books to her. She loves interacting with the books, playing the games, and listening to the stories. I want to maintain the actual book element of these books though, so that maybe her immense love for them will transfer to other books. This book was pieces of the Tinker Bell movie, and Cricket really enjoyed it. Peter Pan and Wendy – Cricket was thrilled to see pirates in the book. Once I got her past that and focused on that book, she seemed to really enjoy it. She especially like the girl, Wendy, and seemed to like Tinkerbell. Tangled Kingdom of Color – Like most easy readers story is sacrificed for word content. Cricket LOVES it though, and is therefore quickly picking up the words. That makes 92 books total so far for 2011. Cricket and I ended up taking an unplanned Spring Break this week. Between birthday recovery, sickness, and everyone else being out of school this week it was just what we needed. We will be back next week with our “regularly scheduled programming”. We did a lot of playing with all of her new birthday goodies, which I’m sure I will elaborate more on later. I do want to share a few pictures of her fabulous birthday cake. A very talented, and incredibly sweet, friend of ours made this cake for Cricket. She worked to make the Rapunzel cake “painting” centered, because that was Cricket’s favorite part of the movie. Please ignore the huge black mark that I used to cover up Cricket’s real name which takes away from the cake. She made the base of the cake a painter’s palette and each of the paint colors were groups of flowers. Then she had an adorable paintbrush bridge. We were all just in awe! Of course, Rapunzel was in her tower overlooking everything. I loved the hair, and all the sweet little flowers climbing up the tower. I’m running a little behind, but Cricket and I had a fabulous week of school. We focused our “studies” around Rapunzel, because that is her favorite right now. We also just had a lot of fun together! One of Cricket’s favorite things about Rapunzel (in the movie) was that she painted. So, we began the week by painting with our easel and water color palette. Cricket loved it, she kept smiling and saying “I’m an Artist”. I also decorated her classroom with the sun banners from the movie and set up these cut out dolls. After Cricket explored the cut out dolls, I had her act out a story that I transcribed for her. Cricket quickly and happily worked through the couple of Rapunzel pages I made for her. I made this color identification sheet, a how many are there sheet, and a See, Spell, Write page. I don’t want to post them because I don’t have the rights to the Disney images, but if you want them for personal use just leave a comment with your email address. We had a lot of fun reading her Tangled book for the Tag Reader together and doing the moon activity that she “earned”. 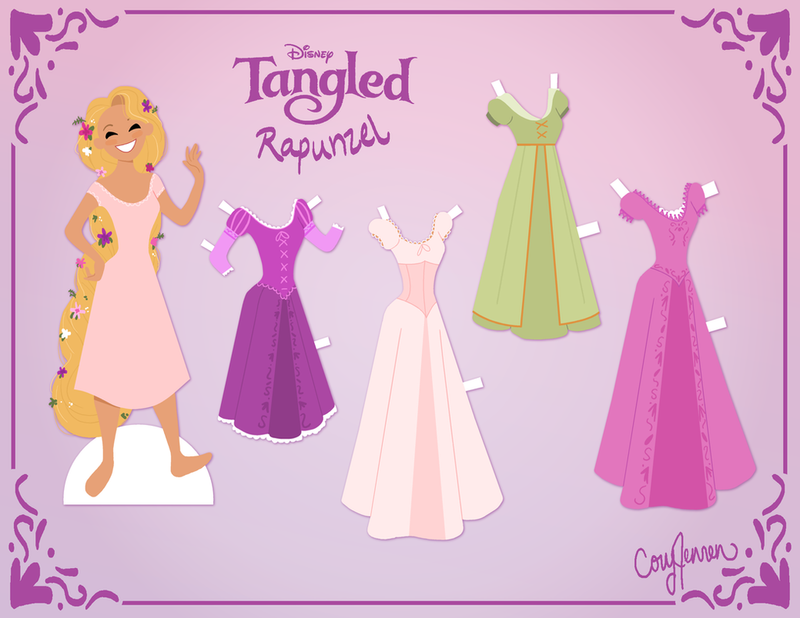 Cricket also picked out a Tangled easy reader on her birthday. By the way, this made me so proud and happy. I took her to Toys R Us with a $3 off coupon hoping to find something inexpensive as a special treat. I will say Cricket did oooh and aaah over some big ticket items, but she steered me to the books and picked out an easy reader. She hugged it and read it through the rest of the story, and all the way home. I LOVE that she loves books! I also gave her a paper doll and clothes for the first time, and she still has them stashed away to play with. She thought that completing Flynn was funny. The Disney site actually had several great activities. Cricket loved seeing her birthday up on our calendar this month, and we had a countdown on the fridge that she enjoyed marking off. Not Rapunzel themed, but at Cricket’s request we did a lot of the power point’s from 1+1+1=1 this week. Her current favorite is the new counting one. If you aren’t a member yet, you should really check it out. Mr Brown Can Moo! Can You? by Dr. Seuss – Cricket loved all the different sound effects in the book and even had fun joining in. This was by far one of our favorite Dr. Seuss books. Ariel and the Secret Grotto – This book was a little longer than we are used to, but it held Cricket’s attention the whole time. She does love the Little Mermaid, and that probably helped. It was a cute story though with Disney quality animations. Precious Moments Beautiful Blessings – This was a cute little board book that Cricket picked out for herself at the library. She asked to read it over and OVER again, and toted it around singing about the story. The Berenstain Bears Think of Those in Need by Stan and Jan Berenstain – I didn’t realize that this was going to talk about Christmas at the end, but no biggie. Cricket enjoyed the book, and I liked that they not only gave away items but also their time. The Birthday Pet by Ellen Javernick – This book was about a little boy that wanted a turtle for his birthday, but received a variety of other pets instead. He did eventually get the turtle, but I wasn’t crazy about the fact that no one listened to what he wanted. On the plus side, Cricket liked the illustrations and I liked the unexpected rhymes. Interrupting Chicken by David Ezra Stein – I had seen lots of reviews for this Caldecott Honor Book, so I was thrilled to see it at our library. The illustrations were beautiful, and I thought the book was very clever. However, I don’t care for bad behavior in books especially when it isn’t corrected. Yes, the chicken was told not to interrupt, but he kept doing it and was ultimately rewarded in my opinion. Party Animals by Kathie Lee Gifford – After reading and being disappointed by the previous book, this one also started out a little rocky for me. I was thrilled that the book turned around though, a wise owl gave good advice and bad behavior was corrected. I think this was a great read, and I definitely recommend it if you have a birthday coming up. Happy Birthday Monster by Scott Beck – This book didn’t really draw Cricket in, there were too many puns and jokes that she just didn’t get. I would think it would be better in a year or two and would probably be more popular with a boy. Happy Birthday to You by Dr. Seuss – This was a good book. It probably fell in the middle of the pack for us as far as birthday and Dr. Seuss books. We both liked it, we just didn’t love it. The best new book we have read in a long time! This super sweet story was about a zoo worker who made friends with the animals, and what happened when Amos didn’t go to work one day. The story was clever and kind. I loved the illustrations, and Cricket was enthralled. I have to say, personally I was sold with the first image of Amos. His little old man appearance and mannerisms absolutely reminded me of my grandfather which was a nice bonus. That makes 82 books total so far for 2011. My baby isn’t a baby anymore. Cricket turned 4 today! I can hardly believe it, these last four years have just flown by. I thank God for the incredible blessing that he has given me everyday. Cricket is everything I prayed and hoped for and so much more. She is a kind hearted, caring, prissy, silly, independent, particular, rough and tumble daddy’s girl. As she continues to grow up, I pray that I am giving her a solid foundation in Christ. I also hope she sees my love for her daily. Love in the form of hugs and kisses, time spent together, discipline and structure, and so much more. In honor of Cricket’s 4th birthday our school this week is Princess, specifically Rapunzel, focused. For a stART project, we began by reading Tangled, which is a Tag Reader book. This time I actually set and read it with Cricket though. I especially love the Tag books that are actual story books, because we can read them together or Cricket can explore on her own. Anyway, we read the book together and the illustrations depict Rapunzel painting several times. I think this was one of Cricket’s favorite things from the movie. After we finished reading I set Cricket up in front of her Easel with a new watercolor paint palette and just let her create. She had a fabulous time free painting, and I have a wonderful collection of new paintings. She has started adding a catch all at the end of her prayers at night. After she finishes praying for her family and friends by name she says “and everyone else I know”. Cricket has been doing children’s choir for a couple of months now, but no parents are allowed so I have no idea what songs she is working on. After practice this week I asked her again what song she was singing, and she said “I don’t know”. I asked what it was about, and she said “growing”. Still having no clue what song this would be I asked her what was growing. Cricket said “You read the BIBLE and you grow in God.” I still don’t know what the song is, but I thought that was so sweet. As I think I’ve mentioned Cricket’s birthday is going to be this Friday. In early celebration of that, Mimi and Cricket had a little tea party today complete with mini cupcakes. Cricket also carefully collected flowers for a centerpiece. That was at the end of their time together, this morning as I left they were watching Lion King together and laughing at Simba. Then they played Candyland and Dominoes before going to Memaw’s to visit and play. This “play” included raking leaves which my daughter loves. She also got her 1st birthday present from Memaw, and it was perfect. Memaw got her two beautiful embroidered handkerchiefs and a sweet little book about Old McDonald. Cricket loved them, and these were such amazing personal gifts. I love that she is able to have these amazing relationships with her grandmother (Mimi) and great grandmother (Memaw). Cricket is turning four this week, and I wanted to take a moment to note a few of her favorite things at this moment in her life. The one and only thing Cricket asked to have for Christmas was a dollhouse. She is spending more and more time playing with it, and I love hearing how she has the family interact. She is also having a great time with her Melissa and Doug puppet stage that we won and reviewed here. Not to say that Cricket’s favorite things are “material”. She also loves to paint and play with play doh, and this not very artistic momma struggles to keep her entertained. Gymnastics have become a staple in her little life. She goes to class twice a week, and she chooses to practice and play through out the week. As far as favorite people, she has the most incredible relationship with my mother, which I’m sure you’ve seen in my Monday with Mimi posts. Cricket is also making friends on her own, that aren’t related to us or the children of our friends (not to say I’m not making new friends with these fantastic mommies). I’m just so proud of my little bit for branching out and developing these friendships. I know it is important for her as an only child and I know it is harder for her to meet other kids since she isn’t in “school”. According to her she has a “best friend” and they love to giggle and play together. I can’t believe I forgot this last night! My sweet Cricket loves school right now. She asks to do school on the weekends, and sometimes in the afternoon after we’ve completed our lessons. She doesn’t always love my lessons, but she loves learning.